This topic is for collecting various tips and tricks related to Corona. If you have some small secrets that helps you while working with Corona, do not hestitate to share it with comunity. I'm sure everyone will be thankfull for that. One advice or technique per post. No need to cram everything you know into single space - it just makes search more difficult. No chatter. Please, do not post something like thanks, cool, didn't know that. Lets keep this topic for useful information only. Posts that contains no value will be deleted. Don't ask for advice or help, we have aprropriate board for that. However, you can ask if there's something unclear in previous posts or you want to add something from yourself. Bear in mind that lengthy discussions may be split into separate topics. Take advantage of displacement adaptivity. If you have a map that contains quite large areas of almost pure white or black color, you can clamp those colors with color map curve and Corona's adaptivity algorithm will kick in with full strength, saving you a lot of RAM and possibly render time. See attached pictures for proof. Blur displacement maps. 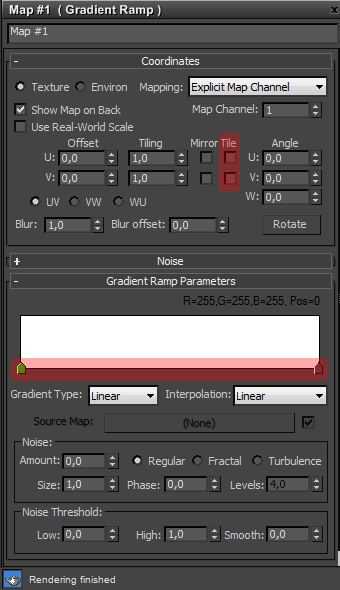 Usually generic textures contains too much high frequency details to be used for displacement. 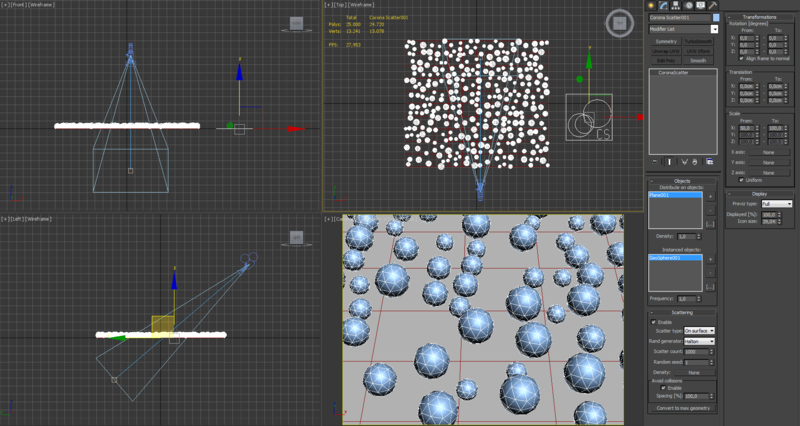 Plug such texture directly into displacement slot and results won't be good (1). One can try to play with color map curve, but this doesn't work well with every map (2), but if one adds a little amount of blurring, wonderful results may be achieved (3). One can always mix blurred texture with original one to bring back a little bit detail (4). Here's small trick with CoronaScatter. Lets say you want to distribute with CScatter some number of instances on certain area as evenly as possible. Usually results are not that good - in some places instances forms clusters, in other places there are large gaps left. That's not exactly what we want. Luckily, there is simple solution. Set scatter count to relatively large number so instances would cover all area without bigger gaps, enable Avoid collisions and adjust spacing until you reach desired density. Since we don't have camera culling option in CoronaScatter yet, we can do it very easy for ourselfs. There's only a few steps required. 1. create distribution plane, give it a few subdivisions (our camera culling won't work very well on a big single polygon), also create objects to be scattered, some camera and CoronaScatter object. Increase scattered instances count and enable avoid collisions. Last step is optional, but without it you may need to constantly adjust scatter count. 2. add camera map (WSM) modifier to distribution plane, click pick camera button and choose your camera. You can change mapping channel if needed or leave it at default. 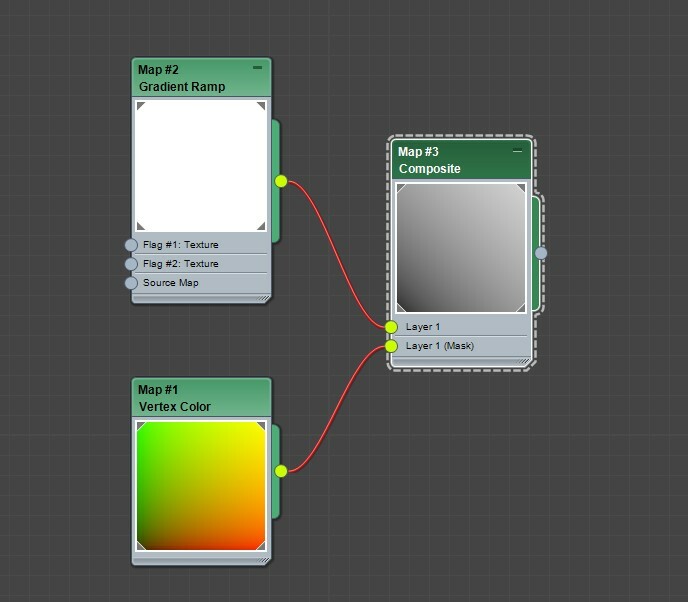 3. open material editor and create gradient ramp map, set it's mapping channel to same as in camera map modifier, disable U and V tiling and set all flag's colours to white. 4. assign previously created gradient ramp to CoronaScatter's density slot. Voila! We have perfectly working camera culling now. Now you can play with gradient ramp to further improve camera culling funcionality. Try to change gradient type to box and set one of the flags to black - you will get nice fallof in instances density. If you need to extend camera culling beyond image borders, decrease gradient ramp tiling to 0.9 or any other value. Instead of creating two separate normal maps like in this fantastic thread where Juraj wanted to create a vegetation shader with both front and back side normals to give better results. He also speaks of how he created the normal maps here also. Corona doesn't have toon shader yet, but it doesn't have to stop us from trying to hack one :] This trick is more based on geometry, rather than on materials, so it may be impractical in most situations, but sometimes it can be useful anyway. BTW, i'm not an author of this technique, i just adapted it to Corona. So let's get started. 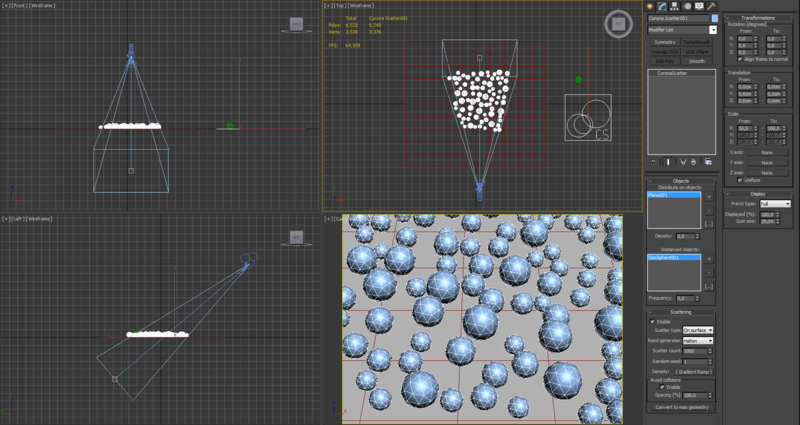 Take an object to which you want apply toon shader and make a copy or reference of it, but do not make instance. Let's call it ink object for convenience. Make sure that it always shares same transformations with original. Link or group a pair to be safe. Apply Push modifier to ink object and set push value to some small number. This will control ink line width. You can always adjust it later if needed. Now add Normal modifier and make sure that flip normals is checked. This step is optional, but it will make easier to select original object in viewport. Additionally you can add noise modifier, to break ink outline a little bit and make it more interesting. And it's good idea to turn on backface culling via object properties, for a visual representation in viewport. That's it geometry preparation is complete. You can copy those modifiers and instance them on other objects if needed. Now, for materials. Original object may have whatever material you want, no restrictions here. Ink object has to be assigned with following material: create CoronaRaySwitchMtl, into all but global illumination slots plug instanced CoronaMtl, set diffuse, reflection and refraction slots of that material to 0, 0, 0 and plug CoronaFrontBack map into opacity slot, set front to white and back to black (or vice versa if you didn't add normal modifier to ink object). That's it, you're ready to render Corona toon! Have fun! You can put rounded edges map in diffuse (or other slots) to see what it does. You can use global volume mtl to simulate having camera under water surface. 3dsMax Tip, but relevant if you don't have a SSD. In your 3dsmax\stdplugs folder: Cut out the following files and saves somewhere as backup. This removes MentalRay, Quicksilver and vue file renderer (Renderer select option) and will prevent the MentalRay libraries from loading, speeding up startup times. How to make "little planet" effect. Next trick originally was posted by Frood. It will print you needed information. For quick acces I ended up with a macro script for my toolbar as one-click solution. If anyone needs it: Paste this into the maxscript listener window, select all lines and drag it to some toolbar, done. message+="\r\n\r\nNote: Auto backup is enabled, this information may be no longer valid after first autosave." messageBox message title:"Renderer information of this file:"